Park City has had several names throughout history, Three Forks, Bell ’s Station and Glasgow Junction. The community developed around the L&N Railroad, the L&N Turnpike, Mammoth Cave stagecoach road and the Mammoth Cave Railway.For many years the town served as a local transportation hub. The historic core of our town is the Bell ’s Tavern site. This historic tavern offered early travelers to the region lodging, dining and a variety of goods and services. From Bell ’s Tavern, travelers would embark to Mammoth Cave and Mammoth Cave National Park from Park City. William Bell, his son Robert Slaughter Bell, and daughter-in-law Maria Gorin Bell operated the successful Bell ’s Tavern. After Robert’s death, Maria married prominent local farmer George Procter. In addition to running Bell ’s Tavern, George became the proprietor of Diamond Caverns in 1859. At the same time, his brother, Larkin Procter, managed the Mammoth Cave Hotel, and also owned the stage line that ran to Bell ’s Tavern, Diamond Caverns, and Mammoth Cave. There was a close relationship between Mammoth Cave and Diamond Caverns for years. Books and cave brochures would describe both caves. Beginning in 1880, the Mammoth Cave Railroad tracks were laid just south of Diamond Caverns. When the line finally opened in 1886, Diamond was one of the chief stops on the railroad. The Procters also commercialized two other caves, Procter Cave and Grand Avenue Cave , accessible from railroad stops between Diamond Caverns and Mammoth Cave . The railroad brought many visitors, but in 1904, the first automobile managed to travel the bad roads and arrive at Mammoth Cave . After the First World War, tourism rapidly increased, with many visiting the Kentucky cave region. In 1921, an oil driller named George Morrison forced another entrance into Mammoth Cave . Competition between historic Mammoth Cave and Morrison’s “New Entrance to Mammoth Cave ” led to vigorous competition among cave owners called the “cave wars.” During the 1920’s, as many as 17 caves were open for tours including Diamond Caverns. Cave vandalism from competitors resulted in destruction of formations in many caves, including some damage in Diamond Caverns. The death of Floyd Collins in Sand Cave in February, 1925, brought world wide attention to Mammoth Cave and the surrounding caves. 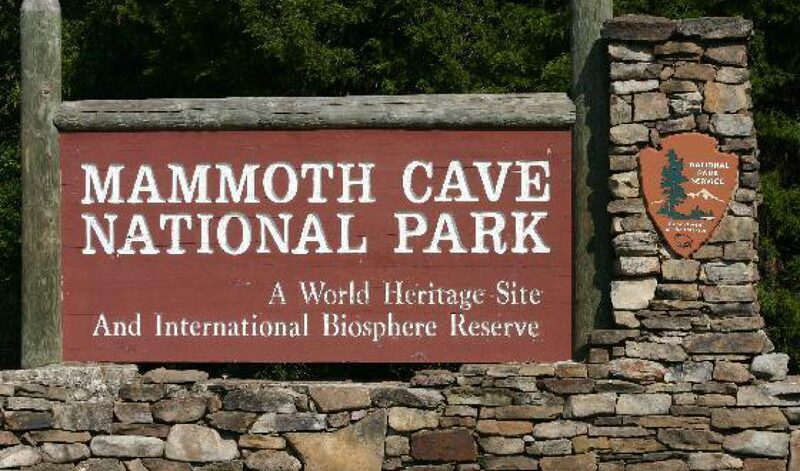 An act of Congress in 1926 authorized the establishment of Mammoth Cave National Park , with the park activated in 1941 and formally dedicated in 1946.